Ahoj! Já jsem Pingkan Dyaning Ratri Azzahra. 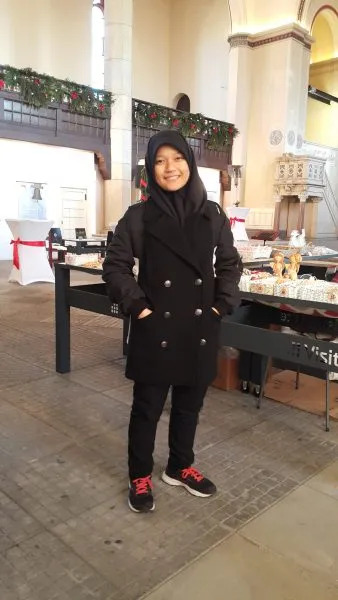 My name is Pingkan, I am from Surabaya, East Java, and I am currently living in Czech Republic for almost 3 months now. I remember it was the 24th of August when I had to carry my heavy luggage and my things alone in the airport, which is quite hard for me because I’m not exactly a strong and tall person. And I was really scared, yet I was feeling really excited at the same time. When I arrived, it was still summer in Czech Republic. 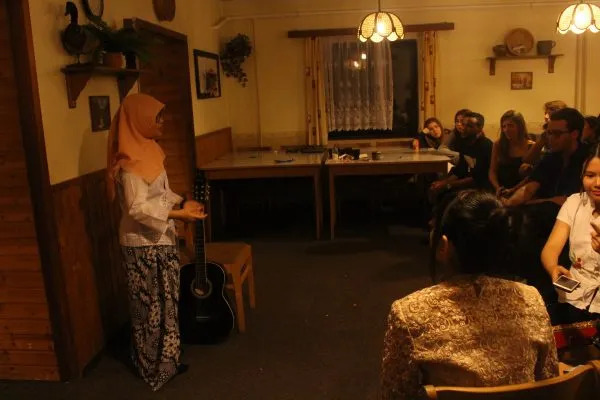 Yet I wondered why it was so cold even in the summer, but when my friend from AFS Program told me it was like hell for her, I couldn’t believe what she just said. That was when I first met another exchange student from Iceland, her name is Jenny, and we talked a lot about stuff since we have to wait for another exchange students for 4 hours. We had an amazing 3 days for the orientation days. We talked a lot about our countries and the volunteers gave us many general informations about Czech Republic. 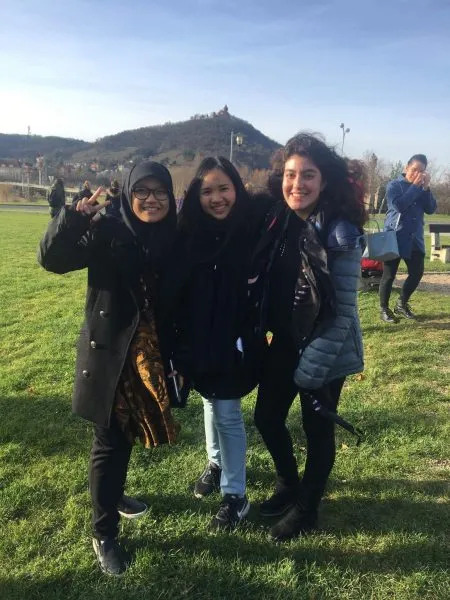 I was really glad that I could meet a lot of students from almost half part of the world, since it was my dream to go studying in another country and meet new people with lots of different point of view. When we finished our orientation days, we still had 1 week to spent. It was nice for me, since I had to adapt to my jetlag and with the weather also, and of course.. the host family. My host family is really nice. But, sometimes, they can be really loud and cheerful too (but not in a bad way, though) because my host family has a lot of members. Here in Czech Republic I have 4 siblings, they consist of 2 sisters and 2 brothers. 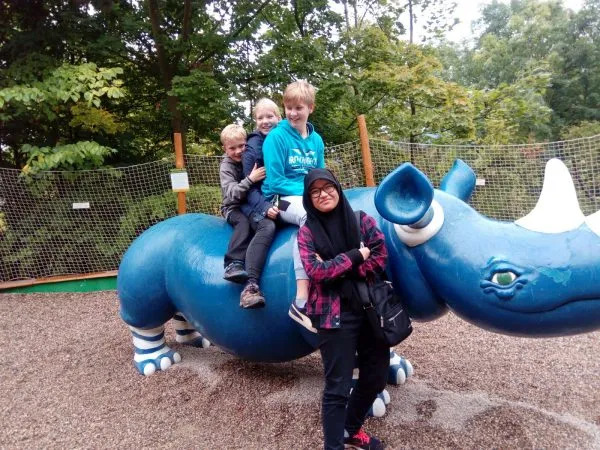 But even though they are sometimes loud, I kind of love it because I don’t get to feel like this very often in Indonesia, since all of my siblings live in another city. In Czech Republic, I live in Ústí nad Labem, which is not a big city, or more exactly it’s an industrial city so the city doesn’t really have that much place to visit to. But at least I still have some places to go when I’m bored though! And for my school, I attend to a school named Gymnázium Teplice. It is located in Teplice, it’s about 45 minutes from where I live. So everyday I have to get up earlier than the other students in my class (plus sometimes I have to walk through the forest since the bus stop is far away!). After 2 months has passed, my chapter (Ústecko) and another 2 chapters held a camp for the exchange students. There, we shared a lot of our stories of how we were doing for the past 2 months. It was nice to meet them, because I can talk to them if I have any problems with my experiences. And we also had games and a talent show! I didn’t know that we were going to have the talent show so I didn’t prepared much. But I played some traditional music with guitar and I wore Kebaya with Batik as the skirt. It was a really nice experience. Recently, I went to Most to do a presentation in another school. I haven’t had any presentations in another school before, so I was pretty nervous at first. But I think I did pretty well! I wasn’t really nervous since it’s not the first time I’m doing my presentation. The students were also very active, they asked a lot about Indonesia and I was really happy that they asked a lot of things. 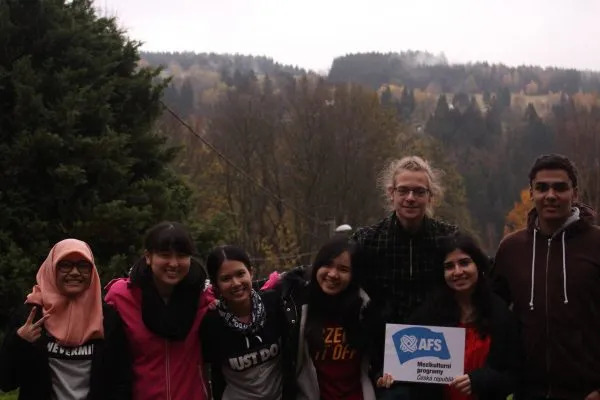 I was with AFS volunteers and also two of my AFS friend from Chile, and Thailand. We talked a lot and also spent some time to walk around the city. Me with my friends from Thailand and Chile. There was one little problem happened not a long time ago, though. I’m joining the chorus club here and we had to sing Christian songs in a church. I was really confused and scared as it was my first time singing inside a church, which I have never done before. But thankfully one of my Muslim friend said that it’s okay as long as our purpose is not bad. So it was a really good experience for me to understand more about different cultures. I also helped my host mom to make the Christmas cookies. It was really fun! I only had a little bit experience in making cookies, but my host sister said that I was really good at it. I really love the ginger bread cookies that my host mom makes. Well, I hope the cookies would stay until Christmas though! We also visited a lot of Christmas Market both in Czech Republic and in Germany. Both of them sells a lot of various things, I always buy some food. Since the food is really good, and I wouldn’t find the same street food in Indonesia. So that’s how I have spent my 4 months so far. I’m still looking forward to lots of things in the next 7 months. But for now, I can’t wait to open my Christmas presents!